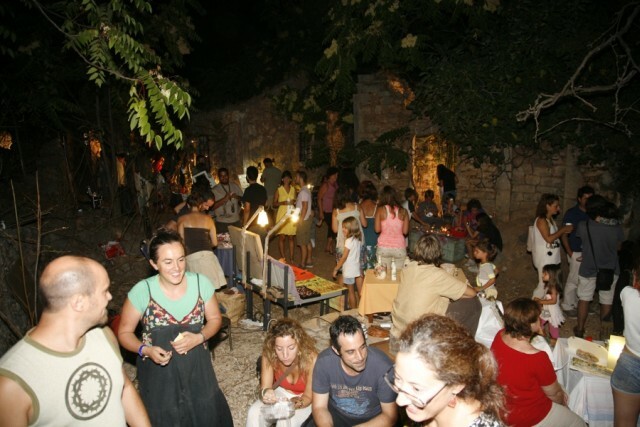 Time travellers and art lovers, if it happens to be in Kefalonia or around the Ionian islands during the weekend 8-9-10 August, here’s your chance to live the unique experience of time travelling through music and art, in Saristra Festival, a festival organized among the ruins of an old village: On 12 August 1953 a magnitude 7.2 earthquake, with its epicentre just off Kefalonia’s south coast, devastated the island and caused widespread damage to the nearby islands of Ithaca and Zante in the Ionian Sea between Greece and Italy. The quake effects would take decades to overcome. 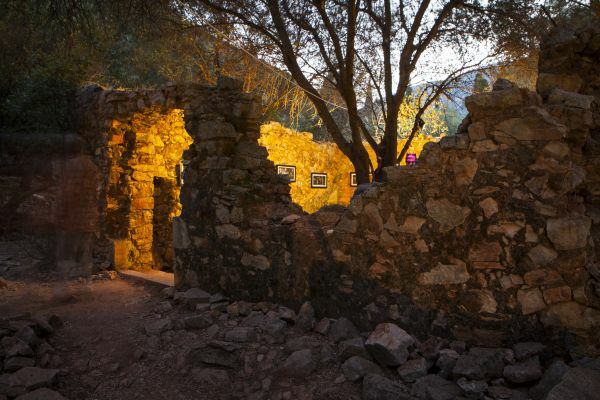 Sixty years later, one of the abandoned, ghost-like settlements in the green, mountainous region around the picturesque harbour of Kefalonia’s Sami, is coming back to life with an outdoor music and arts festival that marks the arrival of a ‘hot’ 2014 summer for the island and its visitors. The Saristra Festival is the most significant cultural event in the Ionian Islands , a music and art festival organised for the past three years and staged in the ruins of the village of ‘ Old Vlahata ‘ Cephalonia which was destroyed ( just as the rest of the island ) by the catastrophic earthquake in 1953.
well known music academics . The internationally acclaimed Eleanor Friedberger from New York whose critics she globally delights. Phoebus Delivorias with his self critical lyrics and Woody Allen type humour guaranteed to bring the audience to its feet . ‘ Last Drive ‘ deemed by many to be the best Greek rock band of all time ( and one of the few to have carved a career abroad ). ‘ The Man from Managra ‘ — Coti.K.s exceptional band ( image producer for ‘Stereo Nova ‘,’ Raining Pleasure ‘ etc) which restructures gospel and has released one of the most significant records of the year. ‘ Egg Hell ‘ Greek – Brazilian Jeff Marawi’s band , the perfect combination of romantic rock and chamber pop. ‘ Indie the Blank ‘ straight from this year,s line up of Schoolwave. ‘ Blue Lagoon ‘ ( Kormoranos team ) and ‘ Shameless Spit ‘ Dj sets. A selection of Greek and foreign creators’ video installations and art within the framework of the well known Festival’s 10th Anniversary. Depression Era has created and supervised a series of dialogues,texts and photographic projects by 33 people who have recorded the new area of the Depression Era in Greece for the first time ever . Interactive installation inspired by the Georgian film by Tengiz Abuladze ‘ The Wishing Tree ‘ . The tree becomes the ‘ eye ‘ of the deepest wish . Treasure hunt , painting and other activities for young visitors to the festival all within a totally safe environment. ‘ From One World to Another ‘ ( 9/8 ) – a Butoh performance by Marianna Tsagaraki and Olga Stefatou Three actions of three women express the transition to a new state of being. Through photography and contemporary Japanese dance BUTOH, they explore the extent and connection between reality and vision. The performance is dedicated to all the abused children. Jazz Workshop and performance by George Tsoli. Photographic portraits of the residents of Karavomylo and festival visitors by Olga Stefatou inside a house converted to a studio. The famous Salonica restaurant comes to Saristra to make < bougatsa > its hybrid desert ( its own creation ) on site which all of Greece has been talking about ( Liana Kanelli is still talking of it ) for the past months .